Questo clavicembalo, di fattura tipicamente italiana del XVII secolo, porta la scritta “F.A. 1677” sul primo tasto. La tastiera si estende su quattro ottave, da do1 – mi1 (ottava corta) a do5. Lo strumento ha due registri di otto piedi accordati al diapason la3 392. E’ stato restaurato da Franck Hubbard e William Dowd a Boston nel 1955 e fa parte della prestigiosa collezione di strumenti antichi di Kenneth Gilbert. 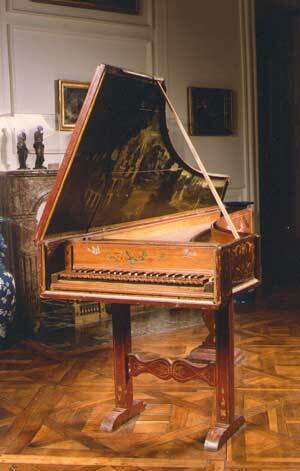 This typical 17th century Italian instrument bears the signature “F.A. 1677” on the first key. The keyboard has a range of 4 octaves (short octave C/E to c””) and the instrument has two 8 foot registers tuned to A=392 Hz. It was restored in Boston, Massachussets, by Franck Hubbard and William Dowd in 1955 and is part of Kenneth Gilbert’ famous Collection of early instruments.